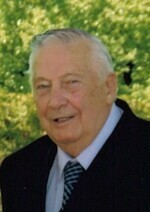 Donald McVittie Obituary - Haileybury, Ontario | Buffam Leveille Funeral Home Ltd.
McVittie, Donald Hardy - With sadness the family announces the death of Mr Donald "Don" McVittie at the age of 91 years. Mr McVittie passed away at Temiskaming Hospitlal, Sunday, June 10, 2018 with his loving family by his side. Born at Haileybury, May 7, 1927 to the late Norman Charles McVittie and the late Mary Douglas Bradshaw. Mr McVittie had worked at the Haileybury Court House until his retirement. He led a quiet life and devoted his time to his family. He was a true family man and will be sadly missed. Predeceased by his parents and his daughter Sandra [Bob] Héroux. Sadly missed by his loving wife Bertha [Males] who he married 64 years ago November 14, 1953. Survived by his children: Dan [Sue] McVittie, Kathy [late Kim] Sauvé, Doug [Tracey] McVittie and Bob [Darlene] McVittie. Fondly remembered by grandchildren: Scott, Jennifer, Kevin, Aimée, Joel, Teri, Ashley, Brandi, Jessica, Taylor, Jordan and Jeremy; fourteen great-grandchildren; and his brother-in-law Keith Adams. In keeping with his wishes, cremation will take place at Lakeview Crematorium. The family will welcome friends Tuesday, June 12, 2018 from 7:00 to 9:00pm for a memorial gathering at the home of Bob and Darlene McVittie, 383 Algonquin Drive, Haileybury. Memorial contributions to the Beverly-Ann Boros Hospice Palliative Care Suite will be gratefully acknowledged. Condolences, contributions and memorial candles may be left at www.buffamleveille.com.